Foo Fighters to take "a long break"
Foo Fighters frontman Dave Grohl has revealed that his band plan to take a long break and that fans shouldn't expect a new album any time soon. Speaking to BBC Radio One DJ Chris Moyles, Grohl suggested that playing the biggest shows of their career at Wembley Stadium in July prompted the decision. 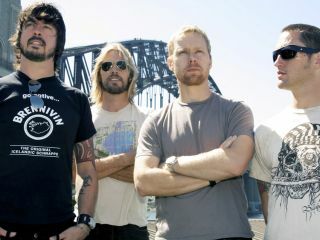 Grohl commented: "We've never really taken a long break, I think it's time. After doing Wembley we shouldn't come back for 10 years because we've played to everybody." "It's a funny place being in the band now because we've been a band for about 14 years. We've gone from playing the Astoria, to playing Earls Court to playing Wembley. That wasn't really the goal but hey, we'll take it. "We're over in the UK every year, every summer so I think it's time to take a break and come back over when people really miss us."